Reform Movement asks Ethics Committee to investigate haredi MKs for walking out of meetings. The Reform Movement has asked the Knesset Ethics Committee to look into haredi MKs' practice of brazenly leaving committee meetings whenever a Reform representative begins to speak. The appeal came after UTJ MKs Moshe Gafni, Yisrael Eichler and Uri Maklev walked out during a discussion on the controversial Mikveh Law. 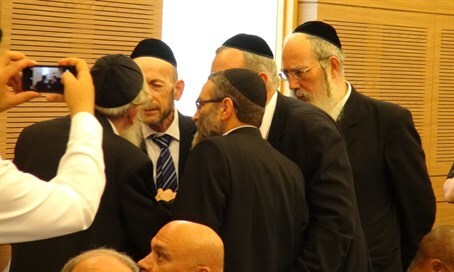 "In the name of the Reform Movement in Israel, we wish to file a complaint against MKs from the Shas and UTJ parties over the manner in which they repeatedly and brazenly leave Knesset committee discussions whenever a representative from Reform or Conservative Judaism receives permission to speak from the committee head," wrote Gilad Kariv, a lawyer who serves as the executive director of the Reform Movement in Israel. In his letter, Kariv explained that the Knesset committees are intended to clarify issues that do not have a widespread consensus among all participants. "Specifically, we ask you to deal with the conduct of MKs Moshe Gafni, Uri Marklev and Yisrael Eichler. Legislative actions are the heart of parliamentary work. Legislators must take part in Knesset committee discussions in which a variety of opinions are expressed, including those with which the legislators disagree. "Currently a Knesset member pushes for legislation that directly harms the rights of a group of Israeli citizens, and that same MK bluntly, crudely and sweepingly refuses to hear that group's opinions, undermines the principles of the legislative process and the MK's public duties." The Ethics Committee has demanded a response from the haredi MKs.